The controversy over the Foreign Correspondents' Club's invitation to Hong Kong National Party convener Andy Chan Ho-tin to speak at a luncheon meeting have given critics opportunities to demonstrate patriotism, which is just fine. The concern is what the row may lead to when criticisms get ultra-nationalistic. That's a valid concern in view of what's happening right now, as the furore is heating up to a dangerous level, with pressure mounting on the government to recover the historic building that the FCC has leased since 1982, in revenge for the club's refusal to cancel Chan's invitation. Even if it was inappropriate for the FCC to invite Chan to be a guest speaker, is it necessary to go to that extreme with radical eviction calls? It's alarming and disproportionate. The issue was first raised by the Foreign Affairs Ministry's commissioner in the SAR, then dramatized in no time by Leung Chun-ying, the former chief executive who was told by Beijing not to seek re-election in 2016 so that he could "devote more time to the family." Ultra protagonists of the FCC should never be surprised by the journalistic body's resolve to safeguard free speech, since this has always been an essential part of its long tradition. 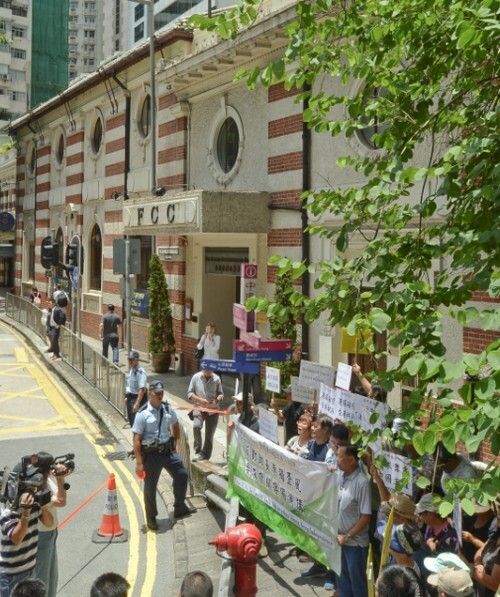 Failing to get the private members' club to accede to their demands, critics put the FCC's premises on Lower Albert Road in Central firmly in their crosshairs in retaliation - attacking first with alleged breaches of lease conditions, subsequently with release of false information on the rent, then with subversive claims and demands to evict the club from the North Block of the Old Dairy Farm Depot. But do they know that as they fired the salvos, many people were shaking their heads as they looked on? The FCC isn't new to Hong Kong - it's been here since moving to the city in 1949. While it's thought to be a leftover by the British, and too lofty to be accessible to commoners as some may like to depict, it isn't inaccessible as imagined, rather quite the contrary. A subversive base hostile to the Chinese? Give me a break, please! It's all but run by a bunch of volunteer committee members along with an established policy to invite this or that person to give public speeches from time to time. Understandably, there has never been a shortage of controversial speakers. Why, even CY Leung himself addressed a standing room audience at the FCC in December 2012, six months after he took office as chief executive! If the last governor, Chris Patten, was a frequent guest, so were officials from the central government liaison office and the Basic Law Committee. It hadn't been uncommon for the latter to give speeches in English too. It would be in everyone's interest to stop the debate from going ultra-nationalistic. In the end, nobody will seriously agree with Chan's views on independence - regardless of what he may say on Tuesday. Leung will most likely score some political points in Beijing for reigniting an issue that had deeply split the community during his tenure as chief executive. However, the renewed radical attacks will complicate a situation already rattled by the government's plan to outlaw Chan's tiny group.